Early adopters may include the vocal minority of players in massively multiplayer online games (MMOGs) who enjoy player-created housing. They'll tinker obsessively with their dream houses, like your sister playing The Sims. After that, the next city's worth of game buildings may arise in - wait for it - machinima nonfiction documentaries. There's some activity here already. To recreate historic battles, the BBC documentary series Time Commanders (2003) and The History Channel's Decisive Battles (2004) both used a retuned Rome: Total War engine. (Don't confuse the shows' tweaked engine with Rome's most popular mod, Total Realism.) The History Channel also used Brothers in Arms for World War II battle scenes in its eponymous 2005 documentary. Likewise, some architects and designers are using conventional visualization software to reconstruct archaeological sites. For instance, sponsored by the Colgate University (NY) Department of Anthropology and Sociology, the Honduran Ministry of Culture and a slew of government agencies, freelance digital designer Clement Valla is visualizing the ruined Mayan city of Copan. Valla scans hand-drawn plans into the high-end 3-D modeling package Rhinoceros ($995) and photos into PhotoModeler photogrammetry software ($995). In this area, game engines could play strong. A gamer could quickly work up buildings in SketchUp, then texture and light them in Oblivion or Source. Leaving aside research time, a full-featured tour of Copan - or the Great Pyramids, or Pompeii - could require little more effort than a good Counter-Strike map. You could run it on mid-range desktop hardware, with non-player characters in period dress as your tour guides. And hey, if you don't like the guides, you can blow them away with grenades! Match that, Honduran Ministry of Culture! Another possibility: in-engine city guides. After seeing City 17 in Half-Life 2, you can easily imagine a similar map of, say, Amsterdam. Planet PSP already publishes PlayStation PSP travel guides for several European cities, but game-engine guides could actually show you the place. If you could turn on in-engine, user-defined data layers, as in Google Earth, text bubbles would appear as you wander the virtual streets, offering tourist info, restaurant reviews, slides and video clips. 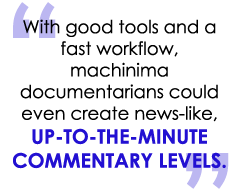 With good tools and a fast workflow, machinima documentarians could even create news-like, up-to-the-minute commentary levels. Make a point about the latest hospital scandal by creating a level based on real photos of a crowded waiting room. All of this will be doable; would it be smart? These works would be trapped in a proprietary engine under someone else's control, subject to the same copyright issues that trouble (not to say "cripple") machinima. (See "The French Democracy" in The Escapist issue No. 88.) Ultimately these creations work best in free or open-source software (FOSS). Unfortunately, of the current FOSS 3-D engines - Ogre 3D, Crystal Space 3D, Irrlicht and dozens more - none approach photorealism yet, and (surprise!) most are buggy and excruciatingly difficult to use. Still, they're trundling along, getting better by the month, or at least by the year. A few open format standards, like COLLADA and X3D, help improve portability between engines. Small teams of gamers could try these projects right now. Are none of them interested? More likely, they just haven't thought of it. Documentary-making isn't yet part of the hobby's mental framework. But functionally it's just machinima, and certainly less weird than, say, This Spartan Life, a talk show staged in an online Halo game. It's a matter of spreading the meme. Real architects may do just that - once they stop laughing.